This part was machined on a Thermwood 5 Axis Dual Table 5'x'5 Model 90 CNC router. The bust was machined out of polyurethane low-density foam and took approximately 5-6 hours for the cycle time. The tool path was completed in MasterCAM X9, and had over 1.6 million lines of code. 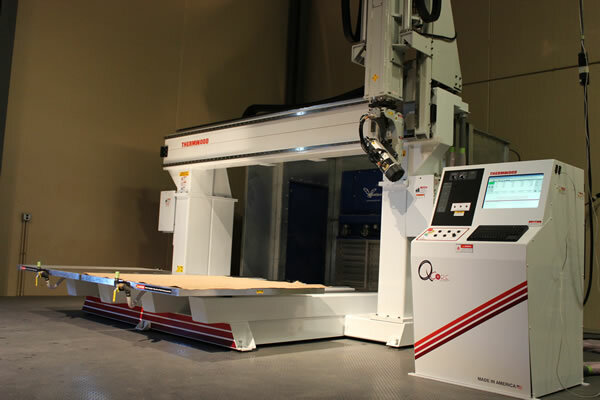 The Thermwood Model 90 is a heavy-duty, high-speed 5 Axis CNC Router specifically designed for high-speed trimming and pattern machining of thermoformed, composite and fiberglass parts. Single table sizes 5'x5', 5'x10' and 10'x5' and Dual table sizes from 5'x'5, 5'x10' and 5'x12' with other table sizes available. This robust system offers a variety of options and features to tackle a multitude of different applications, and is laser calibrated to assure the most accurate absolute positioning and repeatability.